Weight Watchers claim that between 2004 and 2014, UK members together lost eight million stone. Two million people signed up to Weight Watchers lost a total of 11 million pounds in 2011 alone. 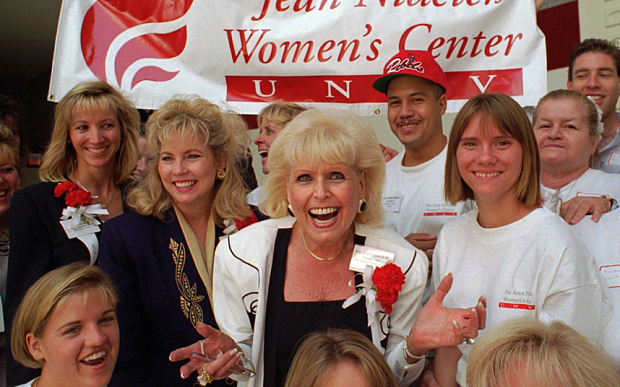 Weight Watchers was founded by Jean Nidetch, who died today. She was spurred on to lose weight after a neighbour assumed she was pregnant instead of overweight. After attending health clinics and deciding their approach was boring, she set up her own meeting with friends in her flat in Queens, New York. It took place near Windsor and since then there have been over 6000 meetings a week in the UK. Since being founded 52 years ago, Weight Watchers has gained over 1 million members. A recent study found that joining Weight Watchers is five times more effective than dieting alone. Average weight loss after three months with Weight Watchers was 8.6lbs, the study said, whereas those who dieted alone only lost an average of 1.8lbs. Due to its success, since 2007 the NHS has provided over £4 million to Weight Watchers in order to help their patients lose weight. It has the highest number of referrals of any diet plan with over 2000 GP’s referring people to the company. In 2014, the NHS announced that two thirds of the population should be sent to state-funded slimming classes like Weight Watchers, which sparked controversy. Unsurprisingly, Weight Watchers is an extremely profitable company. In 2013, Weight Watchers posted profits of over £18 million. Currently the spokesperson is singer and actress Jennifer Hudson. In 2008, 42-year-old Kim revealed she’d lost 211.8lb in two years following the Weight Watchers diet. In 2010 the floor of a Weight Watchers clinic in Sweden collapsed beneath a group of 20 members of the weight loss programme who were gathered for a meeting.